The remains of a First World War hospital ship that sank in the English Channel more than 100 years ago has been given legal protection. About 160 people died when HMS Anglia struck a German mine close to the Kent coast on 17 November 1915. The ship was carrying soldiers, some severely injured in the Battle of Loos, back from France to England. Many of the casualties were soldiers with amputated limbs as well as medical staff who perished trying to save them. Campaigners have long-called for the ship to be protected - to safeguard the remains and honour those who died. It has now been included in a new list of wrecks covered by the Protection of Military Remains Act. Historian Dr Peter Marsden said it was "wonderful to have succeeded at long last" but he was highly critical of the Ministry of Defence (MoD). "This huge story lying on the sea bed needs protection. It shouldn't take years and years to get it done," he said. "It's not just protection of the objects that might be taken by divers, it's the recognition by the government that these are the people who died in service to their country." An MoD spokesman said: "The Ministry of Defence ensures that all wrecks, including HMHS Anglia, are protected under the Act if they meet the correct criteria." He said a survey carried out by English Heritage in October 2014 pinpointed the vessel's exact location and condition, information that was critical for her to be considered for designation under the Act. The shipwreck will be given protective status in March, which is the next available opportunity, he added. The ship sank within 15 minutes of striking the mine off the coast of Folkestone. 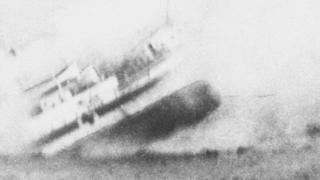 Dr Marsden said many died on their bunks as the ship went down. "It must have been a terrible death," he said. The change, which comes into force on 3 March, will mean divers are still free to explore the site but they must not touch or remove anything they find.